Last fall just after the house walls went up, I was trolling Craigslist for materials when a kind soul posted dark brown corrugated metal roofing for sale, never used. It came in 17′ long panels. We jumped on it and U-hauled seven panels away from his house along with a couple of donated 2×4’s for traveling, kindly given by the gentleman in question whose entire roof had to be replaced unexpectedly instead of covered. Hence selling the panels. Metal roofing is popular for tiny houses because it’s durable, affordable, lighter than asphalt, and relatively easy to install. It goes well with the “cabin on wheels” look that characterize a lot of tiny houses. 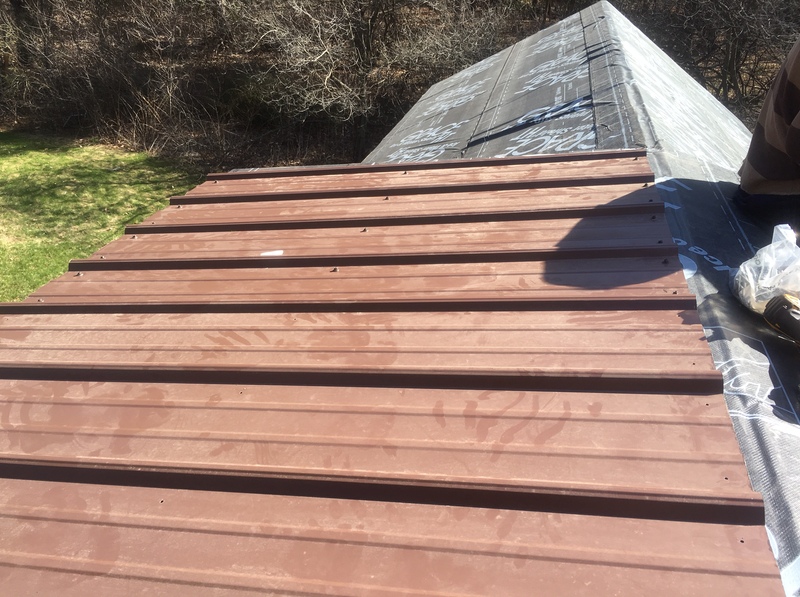 Standing seam is ideal as the fasteners are not exposed to the elements and will last longer, but corrugated is good too. Supposedly the fasteners start to go around 10 years. We’ll see. Metal roofing was Seth’s first choice but not mine. Originally, I wanted shingles, but sometimes you can’t pass up the Craigslist gods when they offer you a good deal. Or as my Memere used to say, “You can’t go wrong!” And of course I love it now. Buying new metal roofing a lot different from buying used metal roofing via Craigslist. For starters, you get all of the accessories with it when you purchase yours from a store. We had to source our trim pieces, ridge cap, foam closures, and adhesives separately. If you’re buying new-ish metal panels for your roof through Craigslist, you should know that there is a good chance yours are made by Union Corrugating, like ours are. We discovered this by accident, but it’s no trick — count the corrugations per panel and see if you can find a match to some of the popular brands available through big box stores. Union Corrugating sells their panels to DIY-ers through Lowe’s, and we were able to confirm this by matching the color of the panels to the colors of the roofing supplies in the store. Then all we had to do was purchase trim, touch-up paint, the ridge cap, etc. If your panels are not easily identifiable like ours, apparently there are such things as universal ridge caps and trim. They may not provide an exact color match, but I’ve seen people who enjoy the two-toned roof, and I’ve seen people who paint their roof so that everything matches. If you’re building a tiny house, you’re no stranger to improvisation at this point. Right? The corrugated roofing process is fairly easy to describe, although less easy to execute (unless you have scaffolding. Invest in scaffolding). There are many, many tutorials about how to install metal roofing so I won’t add one here. I’ll just jot down a few notes about what we did. We used Grace HT Ice and Water Shield as our underlayment. HT means high temperature. I think it was a good investment. Synthetic roofing underlayment lasts a lot longer in UV rays than does 15 or 30 lb. felt, and it won’t glue itself to the back of the roofing panels. We cut our panels with an angle grinder, de-burred them, and then touched up the ends with paint so that hopefully they won’t rust. Butyl tape is weird. It’s like if Play-Dough and Silly Putty got together and had a baby. Special order this because most stores don’t carry it. We followed along with Tiny Home Builder’s method of transitioning the ridge cap from the gable to the dormer. We purchased the videos, but you can sort of see the way to do it in this blog post by Choo Choo Tiny House.